Daily Illuminator: Mastering Fire, Water, And Earth? With GURPS, It's Elementary! November 18, 2013: Mastering Fire, Water, And Earth? With GURPS, It's Elementary! Wood, fire, earth, metal, and water. Cycling between creation and destruction, the Chinese view of elemental forces are as perfect in their balance as they are flavor . . . which makes them ideal for gaming! 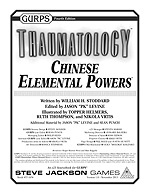 From the mind of William H. Stoddard -- author of GURPS Social Engineering, GURPS Thaumatology: Urban Magics and many others -- comes GURPS Thaumatology: Chinese Elemental Powers, a new magic system that adds these elemental wonders to your game. This supplement features 60 worked abilities and 20 new perks, spread among the five elemental categorizations. It also includes expanded advantages, disadvantages, and skills to create myriad variations of elementalists, plus campaign ideas for using these awesome forces in your settings. Whether you want to attack your foes with the Drowning Embrace, hide yourself with the Smoke Veil, or push your limits with the Endurance of Bamboo, you're sure to add new realms of possibilities to your game. With GURPS Thaumatology: Chinese Elemental Powers, you'll be fired up, get down to earth, and test your metal!